The importance of hydration for antiaging and wellness can’t be overemphasized. Water is essential to human life, and getting enough water for proper hydration is a key strategy in maintaining your health. Water and Hydration Level – How Much is Enough? Water is necessary for numerous processes and chemical reactions in the body, and a poor hydration level will affect your health negatively across the board. There is a lot of confusing information about proper hydration. Given the importance of hydration I will attempt to answer the question of how much water you really need on a daily basis. Based upon the calculations of Dr. John Berardi Ph.D. the following guidelines can be drawn. To maintain an adequate hydration level, adult sedentary (non-athletic) people need approximately 12 cups of water daily, 7 of which must come from water and other liquids. The remaining 5 cups come from food and metabolic activity. For athletes this figure can go up to 8 cups of water and if they are training and competing in a warm climate the figure might well go as high as 16 cups! Since lack of water can affect every aspect of an athlete’s performance, proper hydration is a must! Many things such as illness, type of foods you eat, weight, gender, body composition, activity level and climate affect water requirements. One test that is an indicator of a low hydration level is urine that is yellow in color. It should be clear to indicate enough water. Since I have already convinced you of the importance of hydration, you might ask what is the best source of water, tap, bottled, filtered, ect. This is not an easy question to answer, and the guidelines I give here are just that “guidelines” not the ultimate definitive answer. Bottled water can come from any number of sources, even in some cases from municipal water supplies! It is not regulated in the same way municipal water supplies are, so it is hard to know exactly what you are getting, in your efforts at proper hydration. Municipal tap water is regularly tested, however it contains both chlorine and fluoride, both somewhat toxic substances. If you do drink tap water, it absolutely should be filtered! Municipal authorities claim this is not necessary, however they are incorrect. The addition of chlorine and fluoride both of which are toxic, is a good argument for home water delivery. This is one way to ensure drinking water without deliberately added toxins. There are several types of filtering you can use for your water, from the simple pitcher types, where you replace a cheap filter every so many gallons, to countertop, under sink, and even filters that treat the water as it is coming into your home. To filter out every form of contamination from pathogens to chlorine and fluoride, you would need a filter that uses a reverse osmosis mechanism. This is the most effective system, but where your health is concerned, you can never be too careful. People in rural areas sink their own wells, and in this case, regular testing of the water as well as filtering is highly desirable. The importance of hydration merits spending the time and money to ensure that your water is clean, pure, and safe to drink at all times. There ARE a number of sports drinks, which are good at replacing electrolytes, lost due to sweating. The rules about sugar, and artificial ingredients still apply. Proper hydration requires a product that provides needed minerals for athletic performance. The importance of hydration for such things as alleviating pain, ensuring the proper function of your nervous system, brain function, ect., may not be well known, but hydrating is a key factor in how you age. Since your body is an electrochemical organism, proper hydration is necessary for the conductance of nerve impulses and the transfer of information between cells. Hydration levels have a direct affect on nerve function, and pain thresholds. 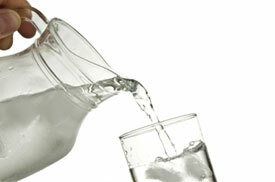 People who are in constant or chronic pain often show some level of dehydration, as well as poor diet. Water while not a cure all will make a marked difference in the quality of life on a day-to-day basis. The importance of hydration is never so apparent when you consider that as we age our bodies lose water from within our cells, at precisely the time when those cells most need it! Is the secret to antiaging so simple as making sure we drink enough water on a daily basis? Well, it is certainly a step in the right direction. In our search for better health, the simple act of making sure we get our needed water everyday is a powerful antiaging strategy? Something easy and simple like the importance of hydration, so easy to overlook, may be just what you need!